distribution Statewide. Though no records for four counties in the southwestern tip of the state, it is assumed to occur in all 100 counties. abundance Common and widespread across the Coastal Plain and Piedmont; common in the northern and central mountains, but less numerous in the southwestern mountains. flight A very long flight period for a damselfly -- from early April to late December in the Coastal Plain (though scarce after early November). In the Piedmont and mountains, the flight starts around mid-April and extends to mid-November in the Piedmont and to mid-October in the mountains. habitat A wide array of ponds and other still water habitats, even slow-moving rivers -- especially where emergent vegetation is present. comments This is one of the state's most common damselflies, and one of the few that is numerous in truly coastal counties. 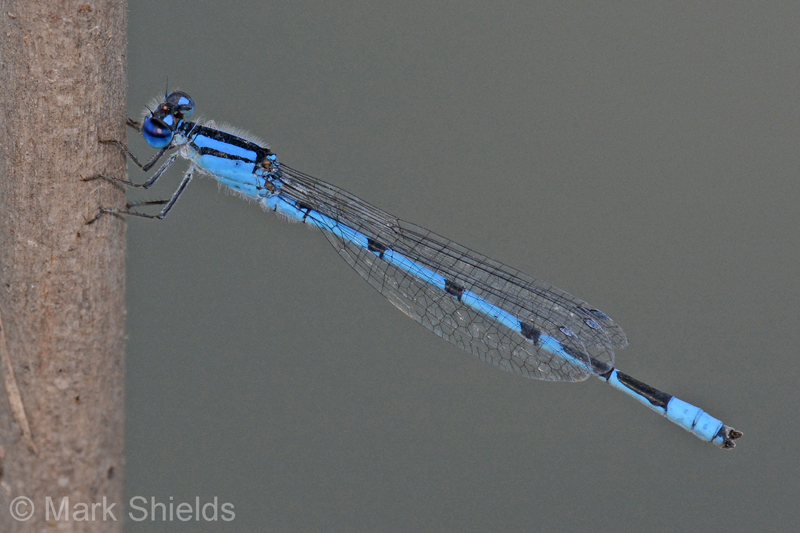 It is quite similar in appearance to Atlantic Bluet, and thus sight reports of these two in the Coastal Plain must be made with care and might be suspect. Comment: Mecklenburg, 2013-05-15, Colonel Beatty Park (Meck/Union county line) - temp. near 90Â°, gusty wind.